nnn is a very fast terminal file manager whose main goal is seamless desktop environment integration. The Ncurses based keyboard-driven terminal application features basic, details (default) and disk usage analyzer modes, with navigate as you type, vidir integration, terminal locker, and more. The application supports basic operations like creating and renaming files and folders, with the ability to select multiple files, open files in graphical tool (using xdg-open or a custom application), as well as more advanced features like batch rename, move or delete using vidir, display media information for media files, and much more. Its developer says that nnn was created because he needed "something that performs on the Pi", and that nnn, which has a binary of only ~60KB, "is probably the fastest and most resource-sensitive file manager you have ever used". You can see a nnn vs ncdu, mc and ranger memory comparison on the project page. nnn 2.1 was released last Friday with new features and various improvements. This release adds support for tabs (also called contexts or workspaces). The maximum number of tabs you can have using nnn 2.1 is 4, and you can switch between them using the Leader key (which defaults to ` or ^/) followed by the tab number (1-4). Each context (tab) remembers its start directory and last visited directory. When you exit a context, the next active context is selected. If the last active context exits, the program quits. The Leader key (` or ^/) is new in this release. This key is case-sensitive and understands contexts, bookmarks and location shortcuts. You can read more about it here. In nnn 2.1, the desktop search and desktop file manager integration were removed. A new GUI app launcher (which supports up to 2 space-separated arguments) was added instead. Press o to launch a GUI app - for example you can type nautilus . to open Nautilus file manager in the current folder. nnn does not yet support tab completion for scripts in $PATH, it cannot view and access network drives, and it doesn't support ssh and scp, but these are on the todo list. There's a video on Vimeo if you want to see nnn console file manager in action (though the video is a bit old). nnn is available in the repositories of many popular Linux distributions. It's in Ubuntu (starting with Ubuntu 18.04), Linux Mint 19, Debian buster and sid, Arch Linux Community repositories, Fedora 27 and newer, and more. See the installation section for how to install nnn in your Linux distribution. If you want to install the latest version, you can find DEB and RPM packages on the nnn releases page. As a side note, the Ubuntu 18.04 package from the nnn downloads page worked without any issues on my Ubuntu 18.10 desktop. 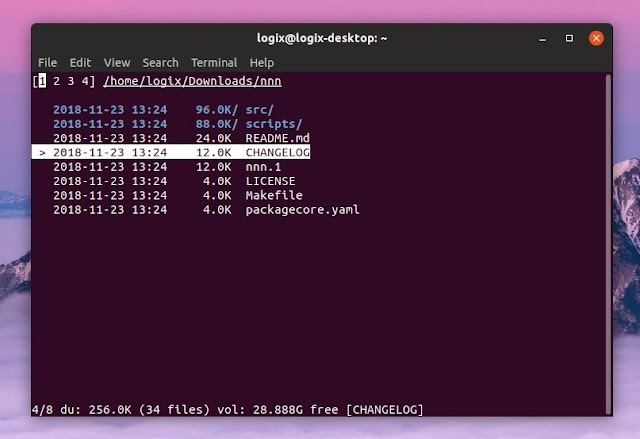 You may also want to install its optional external dependencies (like vidir for batch rename, move or delete, atool or patool to create, list and extract archives, or vlock for a terminal locker). Also see the nnn quickstart guide and keyboard shortcuts. nnn can also be used as a Vim or Neovim file picker .